Besoftware offers its customers the Track & Mark solution, a powerful Marketing Intelligence solution, based on the integration of a compendium of several existing technologies in the market, aimed at detection (through Wifi, Bluetooth, Wireless or other technologies) and tracking of the behavior of customers in a commercial area (a store, a shopping center, an airport …) to be able to perform patterns of behavior and segmentation of the CRM on the one hand, and to carry out actions of direct and personalized marketing on those customers, have App or not, or groups of them or even individuals according to the segmentation that we want to apply, on the other. 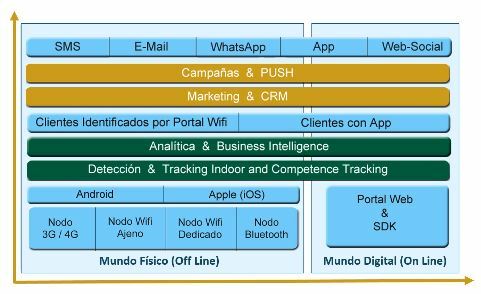 In short, it is about applying typical eMarketing concepts very common in the e-Commerce world but about the commercial physical space, where, in the end, most of the sales and customer relationships are developed for most of the business … welcome to Track & Mark! 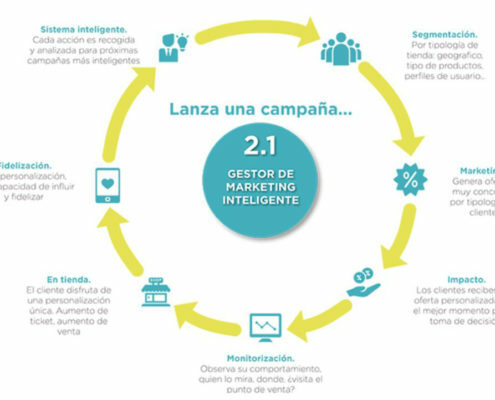 We have a simple and intuitive intelligent marketing management system that allows you to manage, from a single platform, one or several points of sale, obtaining a detailed mental map of the habits and tastes of each client, to develop immediate and effective marketing actions, measuring their results in real time. Get a deep knowledge of your client, to make the exact decisions. We have a set of technologies and applications designed to offer personalized, effective and tangible solutions to brand and point of sale managers. On the other hand, we innovate with an audio data solution that uses sound waves and software to transmit customizable data streams. These high frequency sound waves, which we call Smart Tones, can transmit data using a speaker between any smart device with a microphone. Using the existing audio infrastructure / hardware, the Smart Tones are reproduced, being received by the smartphones, tablets, computers, etc. that we desire. The end-user device has the SDK installed in an application. The SDK then demodulates the audio to obtain information and triggers an activation on the users’ devices based on the data contained in the Smart Tone.